The steps in this thread are performed automatically by the srcflux tool. This thread is retained for those users who want to understand the processing in more detail. The tool eff2evt calculates the energy flux in ergs/cm2/sec for each input event, taking the quantum efficiency (QE) and effective area (EA) into account. The QE, EA, and flux values are recorded in new columns in the output file. you wish to calculate the energy flux for an ACIS or HRC imaging observation. eff2evt may also be used on the zeroth-order of grating data. In this case, the tool issues a warning and uses the zeroth-order grating efficiencies for the calculations. It cannot be used on the grating arms because the off-axis position for diffracted events does not correspond to the event position, but to the zeroth order position; therefore, the vignetting correction will be wrong. The Chandra Source Catalog (CSC) - reference fluxes for most sources are available from the CSC with no analysis required. Note that the fluxes in the CSC are calculated for specific models (absorbed power law and blackbody) and with certain assumptions about conversion from counts to flux. Last Update: 17 Dec 2014 - Review for CIAO 4.7. Added a note about TIME filtering. where ENERGY is either a column in the input file (ACIS only) or the supplied monochromatic energy (ACIS or HRC). Remember that the ENERGY column is the scaled, gain-adjusted pulse height channel and represents an estimate of the mean energy of photons in that channel. The conversion factor from eV to erg is 1.60217646e-12. eff2evt uses the per-chip exposure time to compute the FLUX values. Therefore, any filtering on TIME must be done before running eff2evt. The value of the energy parameter controls at what energy the QE and EA are determined. This may be set to a monochromatic value. Most users, however, will want to leave it at the default of "INDEF", which tells eff2evt to use the ENERGY column in the input file to do the lookup for each event. The output file, acis_315_flux7.fits, is a copy of the input file with four additional columns: QE, EA, DACORR, and FLUX. Note that this is not the same as calculating a monchromatic energy flux at 1keV, because each QE and EA value was initially determined by the energy of the corresponding event in the input file. When running eff2evt on HRC data, it is necessary to set the value of the energy parameter. This parameter controls at what energy the QE and EA are determined. Since energy is not explicitly resolved in HRC observations, the energy is determined at the discretion of the observer; this thread uses a value of 1.1 keV. The output file, hrc_990_flux.fits, is a copy of the input file with three additional columns: QE, EA, DACORR, and FLUX. For HRC, the DACORR is not applicable and the value is always 1.0. These methods of examining the output are independent of the instrument used (ACIS or HRC). Adding the flux values withing a source or background region results in the total flux for that region. This is easy to do with dmstat since the flux is stored as a column in the event file. An energy filter should be supplied to exclude particle background events at high energies. This was done in the first dmcopy step. Here the region circle(4191.5,3857.5,158.74268) is used; it is displayed on the data in Figure 1. The region circle(4191.5,3857.5,158.74268) is displayed on the data. The flux values calculated by eff2evt within this circle will be summed. The total flux within the region in the 0.3 to 7.0keV energy range - "sum" - is 2.568e-12 ergs/cm2/s. The Data Model has the ability to weight the binning of a file by any column. Weighting by the flux column creates an image where the pixel values are the energy flux per pixel. The region from the previous example, circle(4191.5,3857.5,158.74268), is used in binning the image. The output image, acis_315_flux7.img, is displayed in Figure 2. 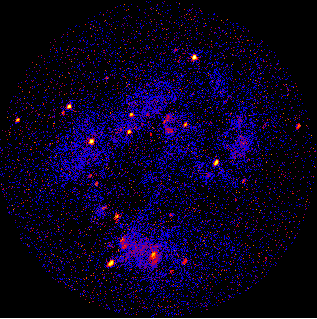 A region-filtered image of the ACIS data, weighted by the flux column. The pixel values are the energy flux per pixel. The tool dmstat may be used to calculate statistics of the image. This may also be done from the CIAO analysis menu in ds9: "Analysis → CIAO → Statistics → All (no centroid)". 15 Dec 2010 updated for CIAO 4.3: if grating data is input, eff2evt issues a warning and uses the zeroth-order grating efficiencies for the calculations. 10 Jan 2012 reviewed for CIAO 4.4: updates to screen output, the FLUX_LO/HI/WEIGHTED columns are only created by eff2evt when the rmfimg parameter is set. 03 Dec 2012 Review for CIAO 4.5; added note about energy filter. 26 Nov 2013 Review for CIAO 4.6. Added info about srcflux. 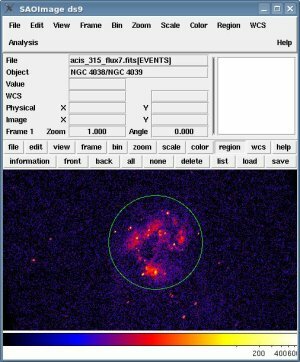 Added info about early data and need to run chandra_repro or r4_header_update. 04 Mar 2014 Final review for CIAO 4.6. Updated for new DACORR column and latest calibrations values. 17 Dec 2014 Review for CIAO 4.7. Added a note about TIME filtering.